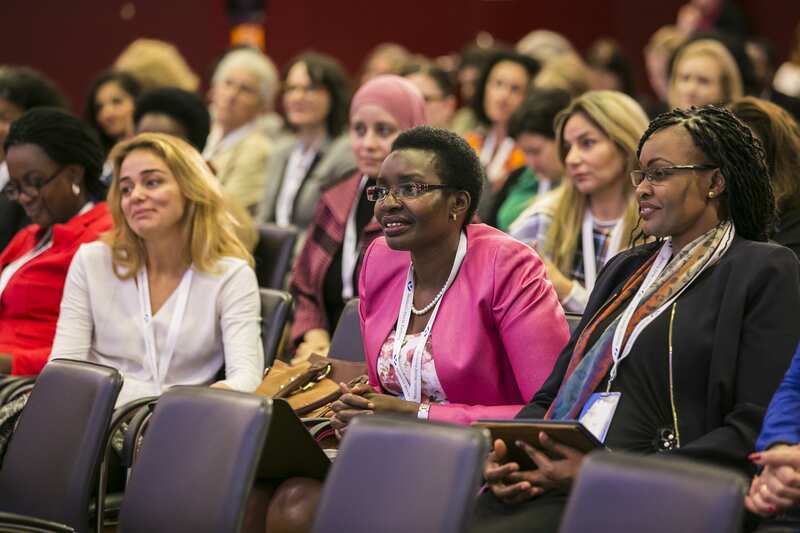 During Women’s World Banking’s Making Finance Work for Women Summit last November, Chief Product Development Officer Anna Gincherman moderated a conversation with three leading banks to understand how they are reaching underserved market segments, including women and youth, through innovative savings products. The panel discussion highlighted several important lessons for commercial banks downscaling to meet the needs of underserved populations. Serving underbanked markets with savings products allows financial institutions to acquire new customers and mobilize deposits. NMB recognizes that meeting the tremendous demand for loans requires a strong deposit base, which means reaching women who are interested in building savings for their children. Similarly, HNB observed that most banks in Sri Lanka were targeting higher-income market segments because they are low-risk and high-return. This left over one million lower-income women unbanked, presenting a tremendous opportunity for HNB to bring them into the formal financial system by helping them save for their children’s needs. Both HNB and NMB understand that reaching youth – and their mothers – means acquiring new, lifelong clients. 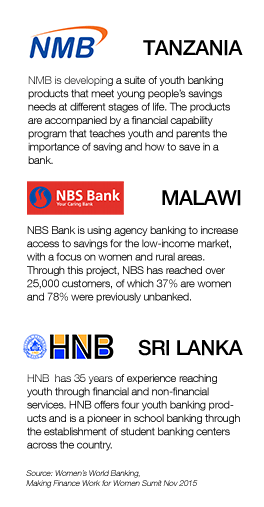 NBS Bank’s entry into the savings market for rural women provides another example to support the business case for greater financial inclusion. Amidst a period of financial uncertainty, the NBS board recognized the importance of a strong savings base of women clients and approved a new savings product for low-income women. All three banks have taken steps to reduce the barriers of cost and distance that prevent many low-income women and youth from accessing formal financial services. HNB introduced school banking units run by student managers, allowing youth to save and access financial education at their schools. As part of its own youth banking proposition, NMB is enabling youth and parents to open accounts and receive financial capability training at schools. NMB agents located near participating schools will also visit schools to collect deposits. Similarly, NBS Bank created Pafupi (meaning, “close to you”) Savings, which relies on a network of mobile sales agents to visit customers in their homes and workplaces and open accounts digitally. By introducing an instant in-field account opening process – an entirely new process for the bank that required significant system changes – NBS drastically reduced the barriers to entry for new savings clients. The bank also made Pafupi Savings more accessible to low-income clients by offering a minimum balance 20% lower than that of other savings products and encouraging transactions through its widespread network of mobile-enabled agents. When downscaling, breaking even requires a long-term commitment and additional up-front investments by the bank. For instance, NBS Bank expects to break even on Pafupi Savings within three years. CEO Bernadette Mandoloma noted that in order to do so, the bank needs 150,000 Pafupi customers with an average balance of $30, and they are currently at only 25,000. NMB’s profitability horizon for its new youth savings products is around one year. In this case, the bank’s largest investments were in customer education, as the systems for the products were already in place. HNB also viewed its youth banking proposition as a “futuristic mission” and made initial capital investments in training and human resources. All three banks view these investments as critical to developing a savings culture and mobilizing low-cost deposits. Savings products serve as an entry point for underserved markets, allowing new-to-bank customers to become acquainted with the formal financial system before migrating to other products and services. Each of the three banks recognizes that greater financial inclusion represents not only a social good, but also a significant growth opportunity.